HP's refreshed Pavilion line comes in different configurations to satisfy different budgets, but the biggest improvements this year are Broadwell for better stamina and the Bang & Olufsen partnership for clear audio. Even though HP is exploring different notebook form factors with its x360 products across the Spectre, Envy and Pavilion line, the PC-maker isn't giving up on the traditional laptop design. This year's Pavilion notebooks, available in 14-, 15- and 17-inch displays, represent HP's continued investment in the affordable laptop space. The biggest changes this year include support for Intel's latest Broadwell architecture as well as HP's shift to its newest music partner Bang & Olufsen with the B&O Play branding. As the entry models to HP's back-to-school lineup, the Pavilion comes in at an affordable starting price of $479 (£321, AU$621). With varying options for processors, storage, and RAM, the Broadwell-equipped Intel Core i3 Pavilion in a 15-inch form factor starts at $599 (£400, AU$775). At the entry level 14-inch price, you're getting more power - and screen real estate - than a netbook without breaking the bank. The 15-inch Pavilion competes against Dell's 15-inch Inspiron 5000 series at the same price, Lenovo's G50-70 ($449, £300, AU$580 after instant discounts), and the Intel Celeron-powered Asus Vivobook X200MA with an 11-inch display ($300, £200, AU$370). Even Microsoft's recently announced Surface 3 comes in at the $499 (£335, AU$645), though the cost quickly increases if you add in accessories like a keyboard and USB hub to get additional ports. There's a lot of design continuity between last year's Pavilion series and this year's models, meaning that not a lot has changed in the looks department. Users will still get a unibody polycarbonate design with a variety of color options. HP claims that its unibody "Lumia-like" shell design makes the Pavilion feel solid while using less parts, a design approach that Nokia - now Microsoft - favors over metal for its Windows Phone devices. The construction feels quite solid with one solid piece of plastic for the lid, another piece for the sides and undercarriage, and a keyboard deck. Build quality seems to be on par with Apple's retired plastic MacBooks of yore. Even though the Pavilion occupies a blocky footprint, the sculpted and slightly tapered edges make the notebook look slimmer than it actually is. Like recent HP notebooks, this year's Pavilion series will be available in a variety of different colors. Depending on your personal style, you can choose from Natural Silver, Blizzard White, Sunset Red, Cobalt Blue, Violet Purple, Peachy Pink and Twinkle Black. The colors are vibrant and bright without being overly glossy or too matte to make them dull. I appreciated that the finish didn't attract fingerprints or dirt. HP says that the Pavilion series is not slim enough to meet Intel's specifications for Ultrabooks. One reason for this is that the laptops have a built-in optical drive, something that many Ultrabook models are doing away with. For students who may not have a television in their dorm rooms, the Pavilion's optical drive can also serve as an entertainment machine to watch DVDs. As a multimedia device, I found the Pavilion's display to be bright. Like previous generation models, the Pavilion comes with a matte display, which helps to reduce glare and reflections for viewing content. The lack of an edge-to-edge glass panel made the Pavilion's screen look more like the display on rival Apple's MacBook Air, which isn't a bad thing, especially when looking at the notebook's display under bright ambient indoor lighting. Users who prefer to have the versatility of having a full notebook and a tablet should also look at HP's similarly refreshed Pavilion x360 range. In addition to housing on a full-sized keyboard, HP is also including a number pad on its larger Pavilion notebooks. The 15- and 17-inch Pavilion models will come with a number pad for easier number entry, which will be an excellent feature for students using the computer for math, statistics, finance and those who spend hours in Excel. Personally I'd rather not have a number pad and have a centered keyboard and trackpad, which could still be achieved on the smaller 14-inch model. With a low entry price, backlighting on the keyboard is not standard, but the upgrade is available on all configurations of the Pavilion notebook series. Students who work in darker rooms may want to splurge on this upgrade as it makes it easier to see the keys to type. Overall, I found the typing experience on the Pavilion models to be great. The keys have plenty of key travel and are very responsive. Once a review unit comes into the TechRadar lab, I'll be able to form a better opinion of the keyboard. The keys have a satisfying click to them when pressed, and students will appreciate the wide gesture-enabled trackpad on all three configurations. I found that if you're typing hard, the there is a little bit of flex in the center of the keyboard on all models. Unlike more expensive business-class notebooks like the Lenovo ThinkPad T450s, there is no water sealing on the Pavilion's keyboard. I appreciated the water resistant keyboard on the education-targeted Dell Chromebook 11, and its absence here means that students should take care when eating and drinking around the Pavilion. Lacking a discrete graphics processor, the Pavilion line is more suitable for general computing use than for gaming or high-end graphics or video production. Casual gamers will likely be able to run games in more conservative modes with reduced resolutions or frame rates on the integrated Intel or AMD GPU. HP allows customers to configure the Pavilion notebooks with either AMD's 6th Generation A-Series or Intel's 5th Generation Core i3, i5 or i7 processors. HP claims that the efficiency provided by this year's processors bring better battery life. On the 15-inch model that I saw, HP states that battery life comes in at over eight hours, which should last users for a full school day if they don't mind carrying the weight of the notebook with them. On the 14-inch model, the maximum stated battery life is seven and a half hours for the 14-inch model, and over six hours for the 17-inch model. Battery life on the 17-inch model could be better considering there is more space in the notebook to fit a bigger battery. Playing with the laptops, I noticed that applications launched quickly, and Internet Explorer was responsive with multiple browser windows open. We'll have to get a few units in to benchmark the performance of the notebooks, but given the options for the latest Intel or AMD chipsets, most students should be fine with video streaming, DVD playback, internet research, word processing, and even light photo editing and casual gaming. All models can be configured with up to 16GB of RAM and 2TB of hard disc storage. Even though a non-touch HD resolution panel is standard, users can upgrade to FHD resolution and a touchscreen. All models come equipped with an SD card reader, two USB 3.0 ports, one USB 2.0 port, and an HDMI port. The $549 (£368, AU$712) 14-inch model with Intel's Core i3 ships with a 750GB hard drive and 6GB RAM. HP's new audio partner Bang & Olufsen says that the notebooks are tuned to have better sound with cleaner, louder and crisper audio. The B&O tuning can be adjusted for music, vocals and movies, and users have access to a full equalizer for even finer control. Since many students may study with their Pavilion notebooks inside a library, we asked B&O if the enhanced sound tuning will also be available through user-supplied headphones. B&O flatly told us no. This means that the B&O enhancements will only available on the notebook's speakers. B&O's sound experts said that since the company does not have control over the audio drivers and the headphone hardware, it cannot provide the software tuning to bring better sound through standard headphones. 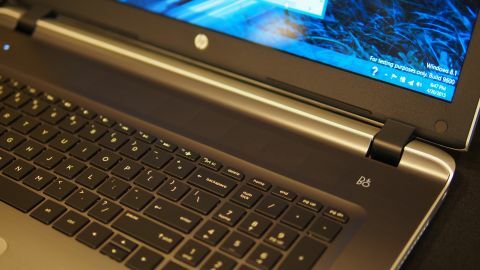 HP executives say that the company had chosen the audio drivers on the notebooks carefully to work with B&O's tuning, so it appears that there is tight integration between the hardware and the B&O software. In my short hands-on time with the speakers, the audio difference with B&O Play enabled is dramatic. There is more dynamic range in the sound produced, and vocals sound louder and cleaner. The sound appears realistic and is not bass heavy - the latter may or may not be a good thing depending on the type of music you enjoy. I didn't have a chance to test out how B&O tuning compared to the prior Beats partnership, but with the B&O sound enabled on the Pavilion notebooks, the larger sound stage is immediately noticeable. The Pavilion notebooks will be available in the US direct from HP starting May 13. Wider availability through HP retail partners is expected starting June 21. The HP Pavilion offers solid performance, decent battery life and great sounding audio. For college students who may not invest in a dorm room TV, the 15-inch Pavilion will be a nice laptop that will satisfy your computing, entertainment and casual gaming needs. The battery bump over last year's model and the B&O Play audio are fantastic. And while the Pavilion 15 has an affordable entry level price tag, upgrading to Intel's latest generation Broadwell Core i5 or i7 processor will bring the cost into Ultrabook range. In this case, unless you need the optical drive, a lighter Ultrabook may be a better investment.